Gin Mare (meaning 'sea') is inspired by Mediterranean culture and made using the finest botanicals of the region, such as Arbequina olives, thyme, rosemary and basil. Serve with lots of ice, quality tonic water and a small garnish of rosemary, orange peel or basil (not lime) for a balanced, silky smooth drink. Distilled from olives, thyme, rosemary and basil. 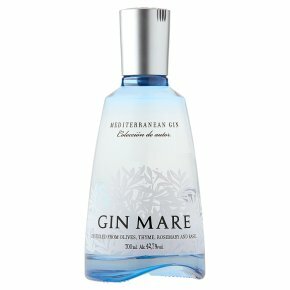 The authentic Mediterranean ''Gin Mare'' is made in a custom designed still by blending individual distillations of Arbequina olives, thyme, rosemary, basil, cardamom, coriander and juniper berries gathered from our own farms and citrus fruits, soaked in advance for more than a year in special large clay jars.